Sargents traditional meat pie was first launched in 1910 by George & Charlotte Sargent, but unfortunately faded out of our history by 1967. 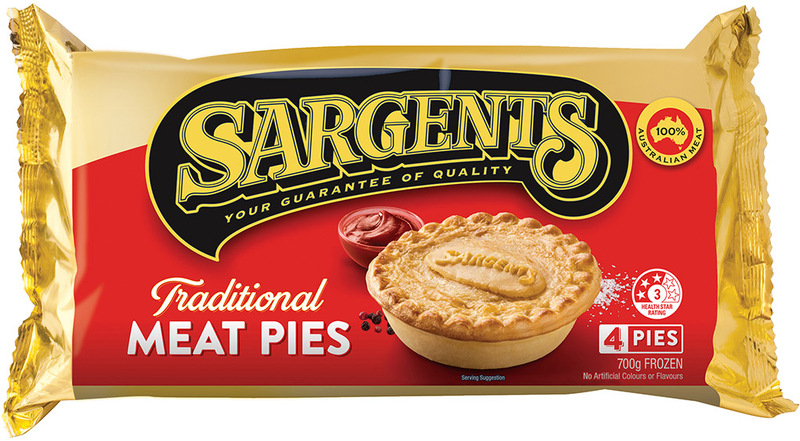 The “Sargents Pie” was relaunched in 1989, bringing back to the consumer an Australian icon synonymous with quality, great taste, convenience and value for money. A product range to be enjoyed by all the family. Made from excellent quality minced meat in a rich gravy encased in Sargents pastry. Water, wheat flour, meat (26%)(beef and or mutton), margarine (animal fat (beef), vegetable fat & oil (palm), water, salt, emulsifiers (471, 322 - soy), antioxidants (304, 307b - soy), natural flavour, acidity regulator (330), natural colour (160a)), thickener (1422), textured soy protein, salt, natural colours (150a, 160a), tomato powder, onion powder, dextrose, hydrolysed vegetable protein, natural flavour, pastry glaze (milk, sugar, natural colour (160a)).